It was a bit of a greyish fall day today and the park was pretty quiet. One of the first things I took a photo of was a car parked in the south parking lot that seemed a bit suspicious. It seemed like maybe they were dumping garbage out as they were parked in the very end spot near the woods while there were no other cars in the lot –and I noticed some freshly dumped garbage very near there. I hung around a bit hoping to catch them in the act but never did. Instead I blatantly stood behind their car and took photos of their license plate hoping to scare them off but they never did move. 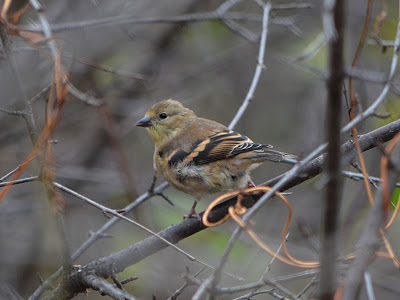 After I moved on I saw only a handful of birds including a Downy Woodpecker, White-throated Sparrow, Goldfinch, Chickadee and Dark-eyed Junco. The Golfinches have now lost their brilliant yellow plumage from summertime, really hitting home that there's not too much left of this fall season. Today was my first visit to the park recently where the water was actually iced over -not totally frozen but just a thin layer. It was only 30º this morning and we had our very first snow flurries in the air just this last Thursday, October 25th so it seems that winter is just around the corner. Maybe I'll actually get to use my snowshoes this year! 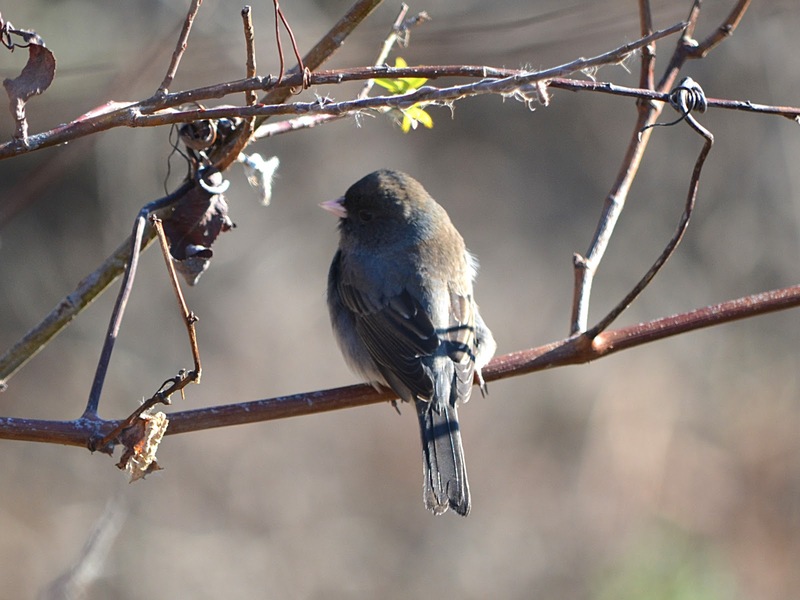 I first noticed Dark-eyed Juncos have come back to our area nearly a month ago, but this morning they made up about every other bird I spotted. I'm always trying for a better photo of one because they tend to flit about quickly and don't let you get very close. This one landed near me for just a split second before moving again. 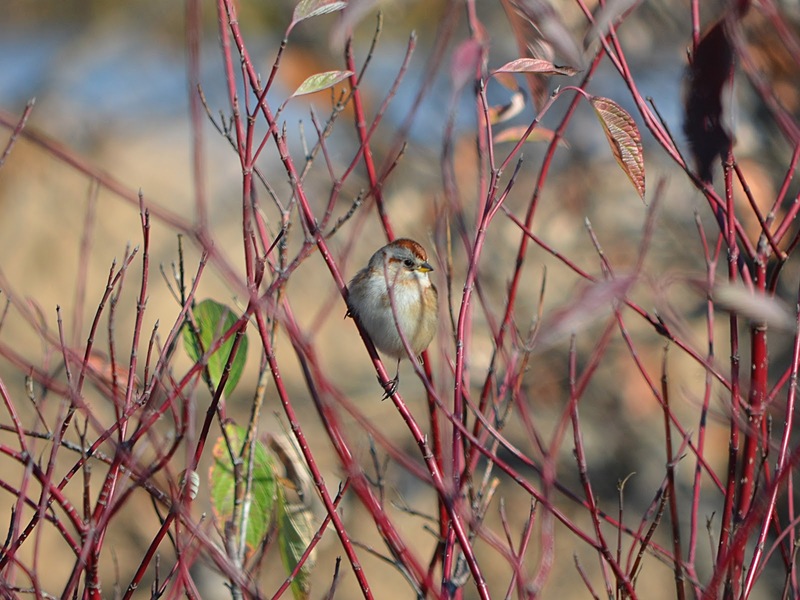 Another bird I don't have many photos of is an American Tree Sparrow. 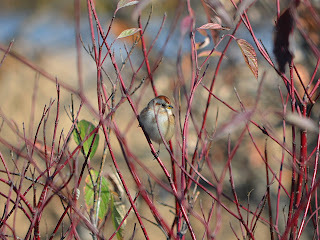 I saw quite a few of them today as their rusty colored cap was very noticeable in the bright sun. If you are able to see them closely enough you'll notice that their upper bill is dark while their lower bill is yellow. People also go by the dark "spot" visible on the breast but I think sometimes this can be kind of tough to see as it's not always that dark or defined. Before I was even half way around the park I ran into a friend (and quite talented birder) who told me that he'd seen a Northern Shrike today -and even as early as 2 weeks ago. I had just been thinking to myself that with as cold as it's been, and how often I'd seen Shrikes last year that they should be coming back any time now. Well as luck would have it, I too spotted one a bit later on the north end of the park. It was perched in the tall dead tree right alongside the straight part of the paved path and I would have missed it had I not been watching more Juncos again. It almost seemed like it was watching the smaller birds below it and I was wondering if I might be lucky enough to see it go after one of them but no luck there. I'm sure I'll be seeing a lot more of the Shrikes this winter season but I was fairly surprised to know they are back so early. 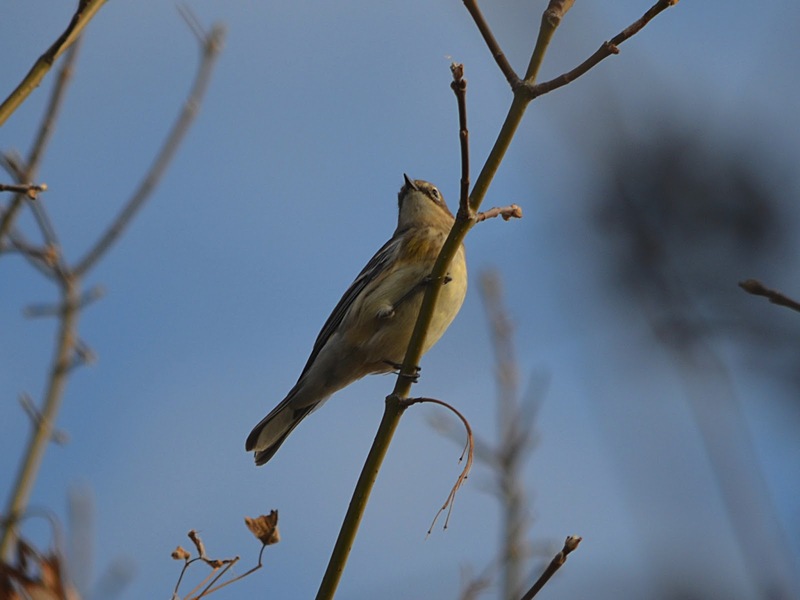 Among lots of other more common birds I spotted today, I also caught a few good glimpses of Yellow-rumped Warblers who are still apparently passing through on migration. All of the Yellow-rumps I've seen this fall have been this brown color with dull yellow shoulders -not the darker blue that you'll see in the springtime. I'd assumed they were all females but I'm wondering now if maybe some are males. Someone recently described the plumage to me as "transitional" so I'm wondering if some could be immature males. 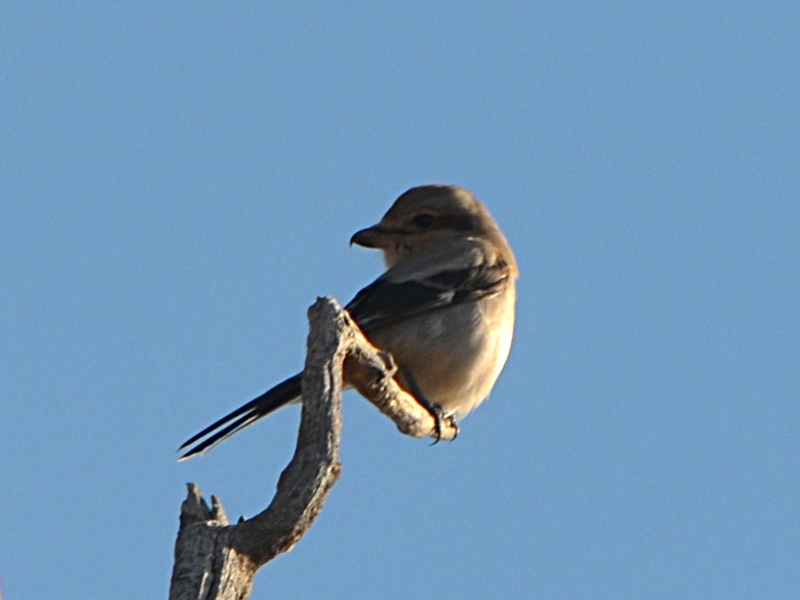 Either way, it was neat to realize that I spotted a Warbler and a Shrike on the same date. It was another gorgeous Fall day this morning at the park. I arrived early around 8am but kept it a quick walk and took just 21 photos by the time I was done. 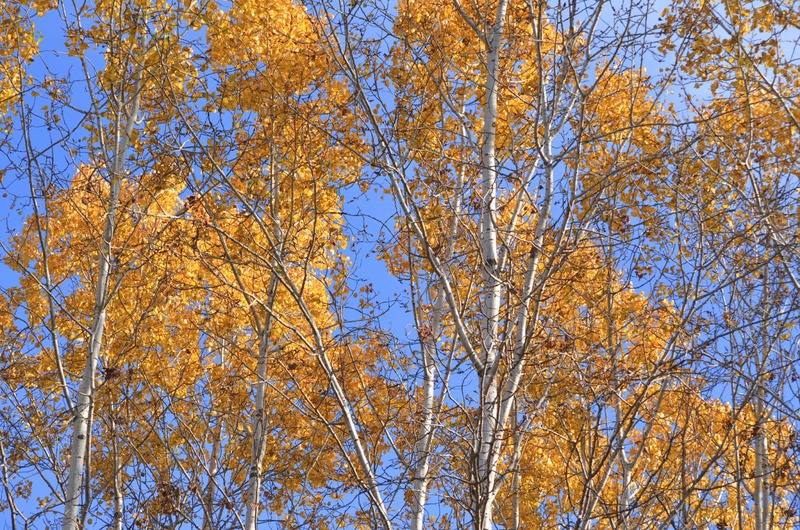 Unlike the northern part of our state, there are still some leaves hanging on here. I'm not quite so good with trees but I think these were Poplar (?) on the northwest side that were so brilliant against the blue sky today. 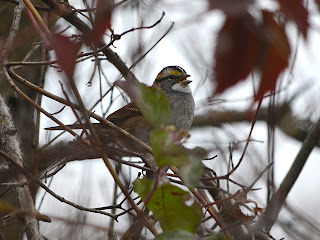 The first bird of note that I spotted this morning was a White-throated Sparrow. I'd not seen one since early October and this time I was able to get just a little closer -though my view was still a bit obstructed as they like to sit "inside" the trees. Later I saw a Red-bellied Woodpecker and also a few Mallards in Shingle Creek. 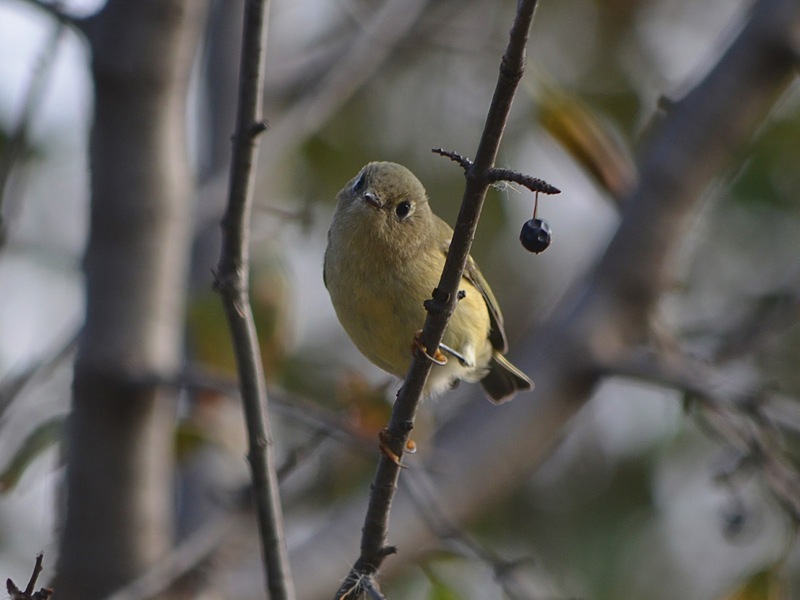 But near the end of my walk I spotted a Ruby-crowned Kinglet and this may indeed be the last one I see this year considering how November is coming up quick. I couldn't tell for sure but it seems it was another female as I never saw any hint of a red crown atop it's head. Today was Monday and I'd just gotten back in town from a nice long vacation along the north shore of Lake Superior. Despite hiking nearly 7 miles a day for the past 3 days in a row, I got out to the park today and spent quite a long time watching the birds and other wildlife. The weather here in the Twin Cities metro area was SO much warmer -and sunnier- than in the northern part of the state so I guess I just couldn't pass it up. It's been getting harder and harder to spot the familiar birds of summer. 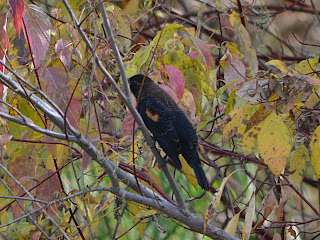 Even the Red-winged Blackbirds have been silent for some time now and I was surprised to see this one as I'd thought they'd all left already. I'd never quite seen a RWB with this type of coloring before. Most noticeably his bright red shoulder patch was quite drab and most of his head was actually quite brown instead of black. Also, the tips of almost all of his feathers showed a similar brown edging. 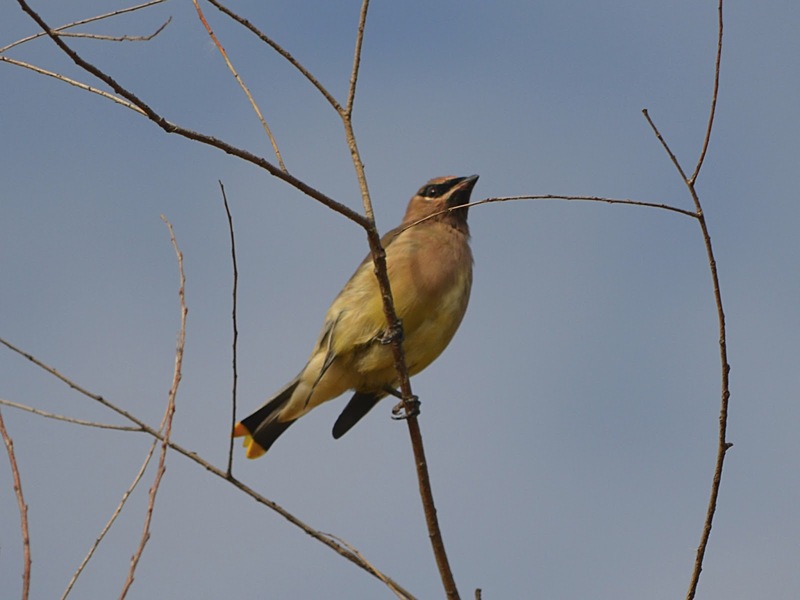 I don't think I've seen one Cedar Waxwing in all of October this year until today. I first spotted him in a Buckthorn tree among all it's still green foliage, but he flew out into the open a short time later. Because of the angle of being more underneath him I couldn't get a look at his wings to see if he had the red tips to tell me if he was at least 2 years old or not. 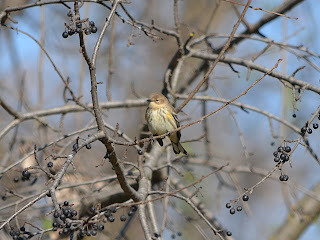 I later ran into another bird I've seen quite a bit of this month - a Yellow-rumped Warbler. Again I found myself underneath it which doesn't make for the best photo but at least I could positively identify it. I'm not quite sure whether all of the Yellow-rumps I've seen this fall have been male or female but based on all of my guides, everyone of them better fits the photos and descriptions of a female. Why this is I'm not quite sure but I've not spotted one this fall with a darker and more distinct pattern of a male. In hindsight this would be the last day I would see a Yellow-rumped Warbler at the park this year. I was lucky enough to spot one interesting bird today that I often think of as a Warbler though it technically is not. 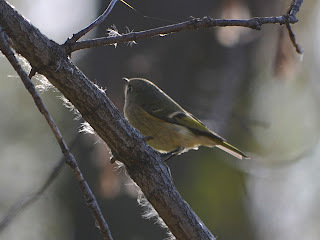 The Ruby-crowned Kinglets have been very active all this Autumn and for the first time I've started to notice them in many other locations besides Palmer Lake Park. This can be an awfully hard bird to catch standing still but I'm always hoping to get a photo of the small red patch on the top of the head for which they are named. Unfortunately only the males have this ruby crown and although I'm quite happy with how this photo turned out, I was a little disappointed to not see that bright red patch atop this inquisitive looking face staring directly at me! Well this Sunday ended up to be a lot warmer, though when I arrived at the park it was only 30 degrees! This time I was a bit more prepared with gloves and warmer clothes but the sun that was mostly hidden yesterday was out in full force to help things out. 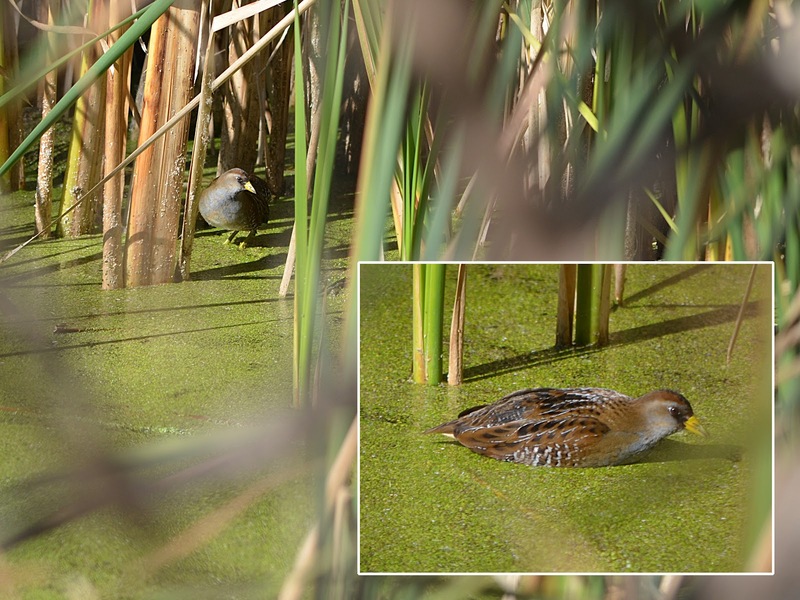 Upon arriving at the park I ran into a fellow friend and birder who gave me a tip on where I might catch a glimpse of the supposed Sora that had been reported in the park. 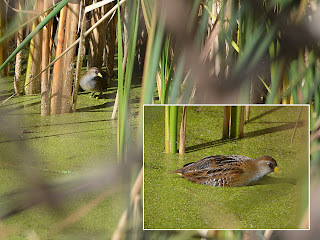 He actually had photos of it to show me and after I explained my brief encounter with it yesterday, we determined that I must have seen something else such as a Woodcock or Snipe -but not a Sora. So after much talk about a lot of birds, I found myself nosing around the purported area. Sure enough it was right where my friend said it would be and I quickly realized that indeed this was NOT what I'd seen yesterday! At first it was standing upright in the water facing me, but not exactly the way I would have expected. It's posture was more of with a bent leg -though I'm not sure if this is typical or not. Regardless, it was quite a colorful bird with grey and brown streaking across the head, a distinctly sharp mottled back side and bright yellow bill that more resembled a chicken than anything else. It stayed very closely in and around the cattails but once or twice appeared to swim -though it's possible it was just standing in deeper water. It appeared to be eating the Duckweed off the surface of the water. It was quite an interesting sighting for me and I've read that they are one of those species that are rarely seen versus heard. Again I saw and heard more White-throated Sparrows today but I also spotted a slightly larger looking sparrow that caught my attention. I've only seen a Fox Sparrow just once before but I was lucky enough to see it so closely the first time that I was able to recognize it again the second time. 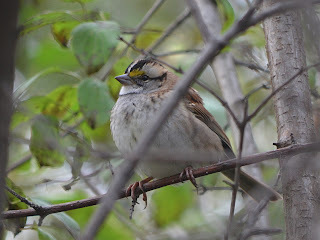 They look a lot like other Sparrows, only their head is mostly solid grey versus patterned like the rest of their body. 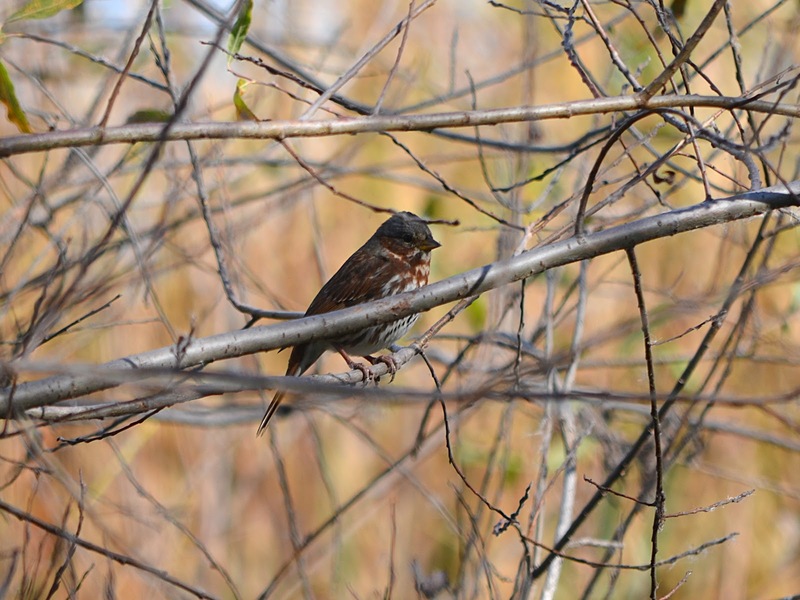 They're also noticeably larger than say a Song Sparrow or Tree Sparrow. 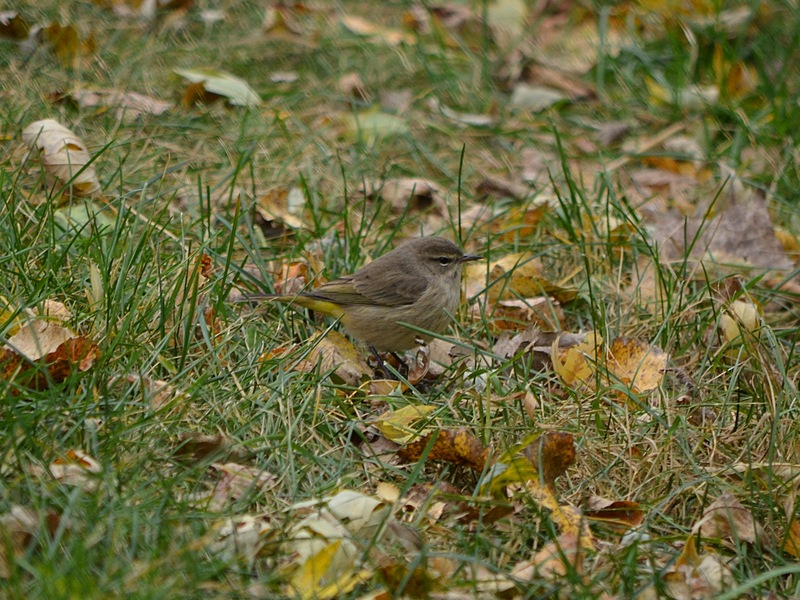 The last bird pictured here is a Yellow-rumped Warbler; something I've been seeing a lot of lately. You might wonder "where is the yellow rump?" and the answer is that it's actually on the top side, not the bottom and is hidden in this particular view from below. I've seen so many of these recently -not all at Palmer Lake Park- but enough to recognized that they are females in "fall plumage." The size, faint hint of a yellow shoulder and the distinct wing bars still give it away even without seeing the yellow rump from behind or above. A Little Snow and Some Fantastic Birding! Yes, the Palmer Lake Park Nature Blog is still alive -despite having not posted anything in over a month! Believe me, my desktop is cluttered with great photos from late summer and fall but I've just not had enough time to post them. Being out in nature, shooting photos and learning more birds continues to be the thing I enjoy most, but lately I've been focused more on improving -or "coping" maybe is the right word, with some other parts of my life that I certainly don't enjoy nearly as much. I've not been getting to the park quite as regularly as I'd like, but again, I do intend to go back and post a lot of stuff I've seen over the past month. So if you are a geek about birds in our area, you may want to look back every so often. When I got to the park today I could hear White-throated Sparrows singing all over. These are honestly one of the easiest to remember of all bird songs, once you've heard it once or twice. It's also one of the few that I can imitate to any resemblance of the real thing and I soon found them responding to me and coming in closer. They were everywhere today and not a bird I see all that often at the park. I was really not prepared for how cold it was today. We've undergone a HUGE shift in weather recently. Roughly 3-4 days ago, we'd hit 80º and then today it was nearly like winter and only in the upper 30's! I'd not even brought gloves today and just figured I'd "tough-it-out." Boy was I toughing it out alright. After stopping to talk to a fellow birder friend for a while, I could no longer even feel my hands. But things picked up as I walked along with my hands in my pockets and started seeing one great bird after another. Coming around the corner I spotted a large group of sparrows feeding on the ground up ahead but before proceeding I decided to spot them quick with my binoculars first. There was one bird in the group that clearly did not belong with the others and at first I thought it was a young Robin. Then it as it moved around and kept sticking it's tail high up in the air I realized it was a Towhee! 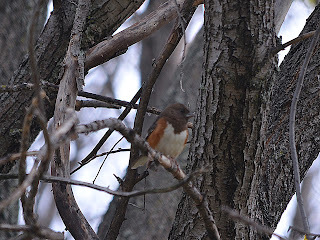 This is only the 2nd Towhee I've ever seen, and the first I've ever seen at Palmer Lake Park! I was too far away for a photo, especially as it was digging in the tall grass up ahead but I approached as closely as I could before it scared up and into a neighboring tree. I tried desperately for a pic as it bounced around quickly and unfortunately this is the best I got. I can see why they're easy to mix up with Robins as the orange color is a perfect match, only there's a very definite line where the orange sides meet the white breast. Next I saw 2 little birds that also didn't seem all that familiar to me as they hopped along the edge of the paved trail ahead of me. They would pick at the edge of the grass, periodically wander off into the grass, and then back onto the trail. I wondered if maybe they were Common Yellowthroats but they seemed a little too large. They were definitely too big for Ruby-crowned Kinglets. I got as close as I could without scaring them off and snapped this photo of the one. 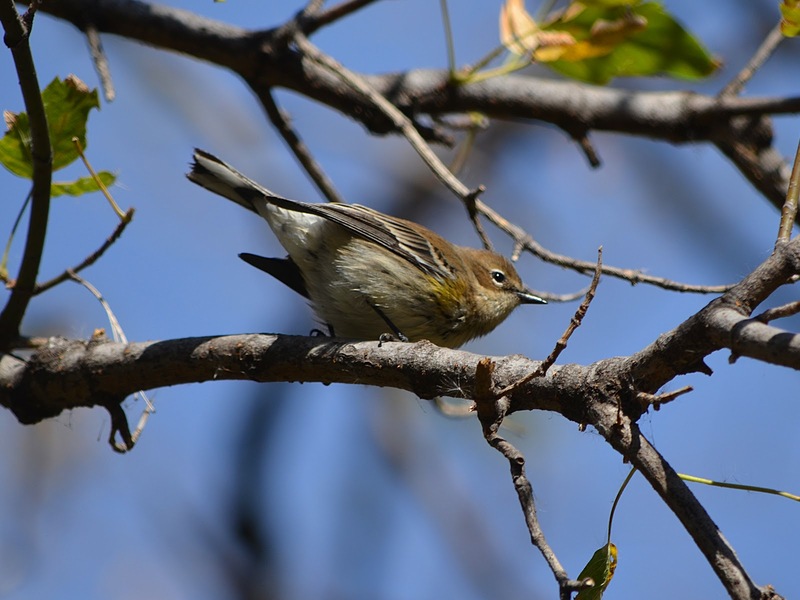 I'm not an expert by any means on Warblers, but I'm thinking they were possibly Palm Warblers! Per my field guide it looks a lot like a "Western Palm" in fall plumage. Shortly later I spotted a Brown Creeper. This is only the 2nd Brown Creeper I've seen as well -and the first one was also in the park. He was making his way up a tree and I hurriedly snapped photo after photo before he got up too high. They are the "chubbiest" looking birds, resembling a ball more than the typical shape of a bird. 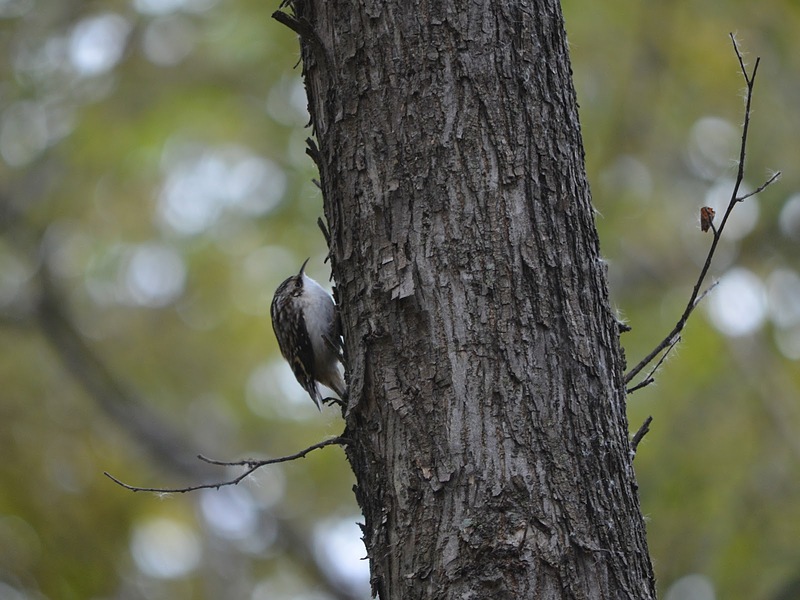 I got to see him actually turn his head and poke his bill into the bark of the tree which made him look slightly more like a regular bird -almost like a nuthatch or woodpecker. Then after this I spotted a first for me anywhere -and quite an exciting species I thought! 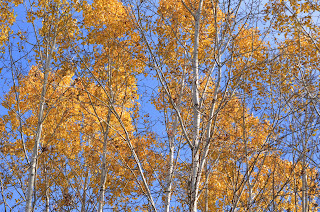 There was a little bird hopping through all the fallen leaves on the northeast side of the park -more where some of the bigger and older trees are, like the large cottonwoods. When I first spotted the bird I noticed how distinctively "olive green" it was and thought -ooh, this is interesting. 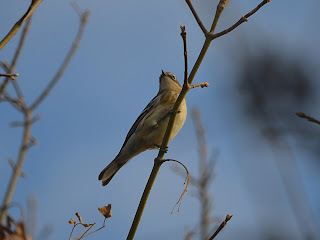 I tried my best to follow it as it hopped along through the underbrush and when it would come into view I could also see a distinct white eye-ring as well as a very well defined white white breast with dark spotting or striping. 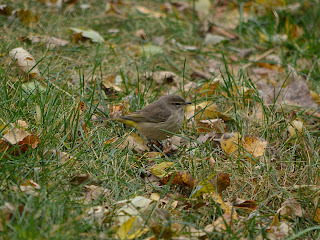 For some reason I knew right off the bat what this bird was -as I must have paged past it numerous times in my field guide to Warblers by Stokes. 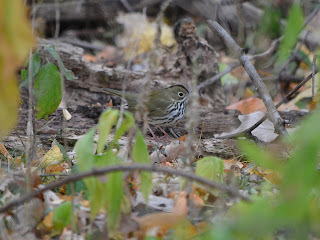 Indeed it was an Ovenbird! 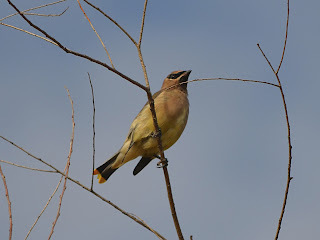 I even saw hints of the yellowish-orange crown on it's head whenever it decided to head directly away from me. This was by far my favorite sighting of the day -even though earlier I'd actually caught a glimpse of a supposed Sora in the area that others had been reporting. I only saw the Sora for a split second though and I got to watch the Ovenbird for quite some time. Still later on the east side as I was coming out of the woods, a group of 6 to 8 Dark-eyed Junco's were ahead on the paved trail. 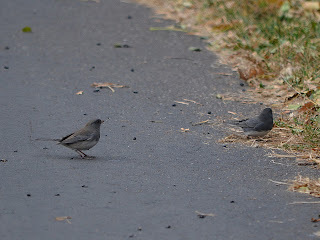 I've seen Juncos already this year about a week ago at a cemetery near my workplace that I've also started birding in. I was shocked to see them last week as it feels so early for Juncos. I think of them as a mid-winter bird that I see in January or February. But I guess with the season changing so quickly they are probably on time. After all, there was actually little snowflakes -or snow pellets- in the air today! OK, I know this is a long post but I saw one more bird of interest today that I was thrilled to see. 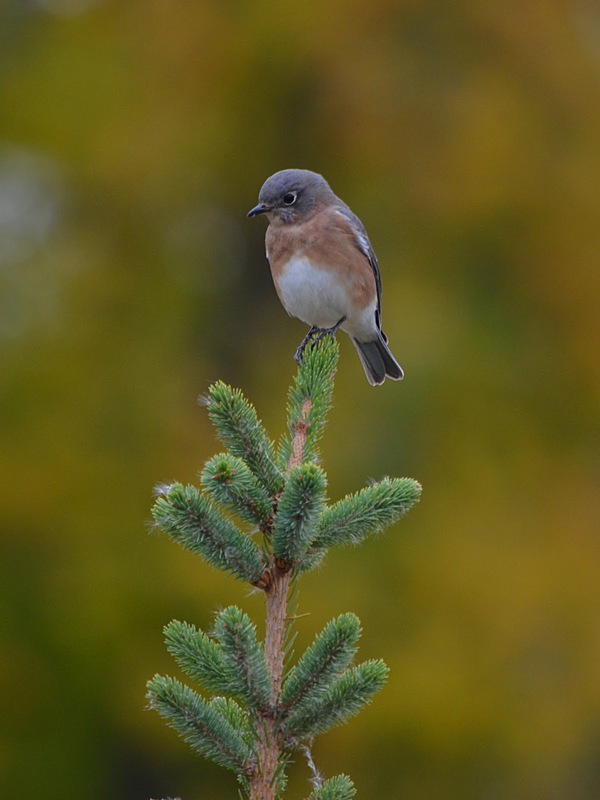 As I was coming back to my vehicle on the east side of the park, there right in front of me were 2 Bluebirds perched on one of the recently planted pine trees. One was actually right on the very top of the tree and I thought this would make a fantastic photo. As I approached slowly, he took off but landed right back where he was in just a few seconds. I kept getting closer as I took my shots and then even a House Finch came in an landed right below the Bluebird. I got a photo of this too but am posting this one after which I'd gotten a lot closer. I've not seen a Bluebird at Palmer Lake Park for quite some time now, -maybe months. 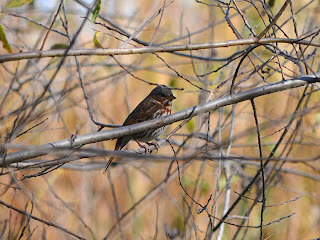 I'm thinking that possibly this bird and many of the birds I saw today were making their way south. 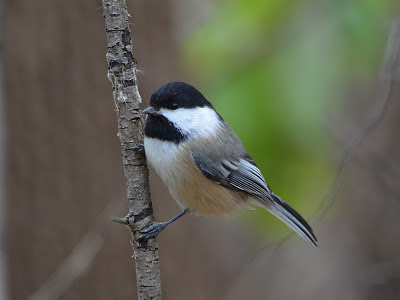 In learning so many birds over the past year or so, I've really begun to appreciate both Spring and Fall for the migration periods and the interesting birds you might not see any other time of the year here in Minnesota.